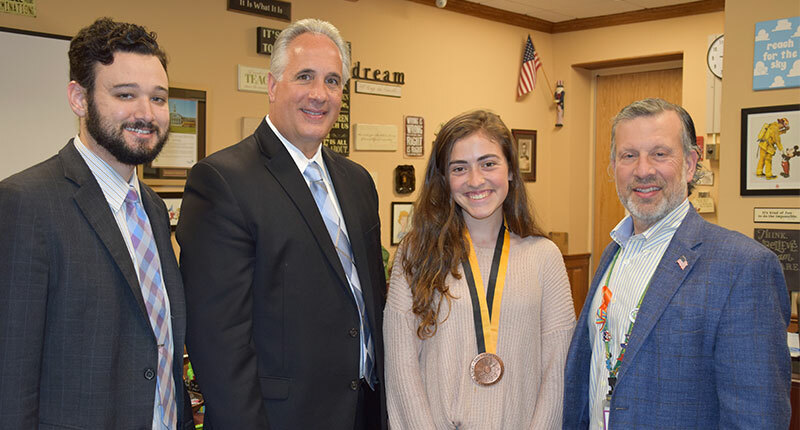 Ward Melville High School senior Madeline Mastriano has been named a Distinguished Finalist in the 2018 Prudential Spirit of Community Awards competition – a nationwide competition honoring young people for outstanding acts of volunteerism. Madeline was one of only eight New York State students selected for his distinction. Madeline has helped to raise $37,000 for the Stony Brook Children’s Hospital over the past five years by running a lemonade stand with her brother. To date, the event has attracted more than 100 student volunteers and 25 business supporters to help with the cause. For being a Distinguished Finalist, Madeline was presented with an engraved bronze medallion. According to organizers, the Prudential Spirit of Community Award represents the United States’ largest youth recognition program based solely on volunteer service. The program, now in its 23rd year, is conducted by Prudential Financial in partnership with the National Association of Secondary School Principals.